The new target launch date for the first astronauts flying aboard a Boeing CST-100 Starliner “is February 2018,” Boeing spokeswoman Rebecca Regan told Universe Today. Word of the launch postponement came on Wednesday via an announcement by Boeing executive vice president Leanne Caret at a company investor conference. Boeing will conduct two critical unmanned test flights leading up to the manned test flight and has notified NASA of the revised flight schedule. “The Pad Abort test is October 2017 in New Mexico. Boeing will fly an uncrewed orbital flight test in December 2017 and a crewed orbital flight test in February 2018,” Regan told me. Previously, the uncrewed and crewed test flights were slated for June and October 2017. The inaugural crew flight will carry two astronauts to the International Space Station including a Boeing test pilot and a NASA astronaut. “As we build and test we are learning things. We are doing everything we can to make sure the vehicle is ready and safe – because that’s what most important,” Regan emphasized. 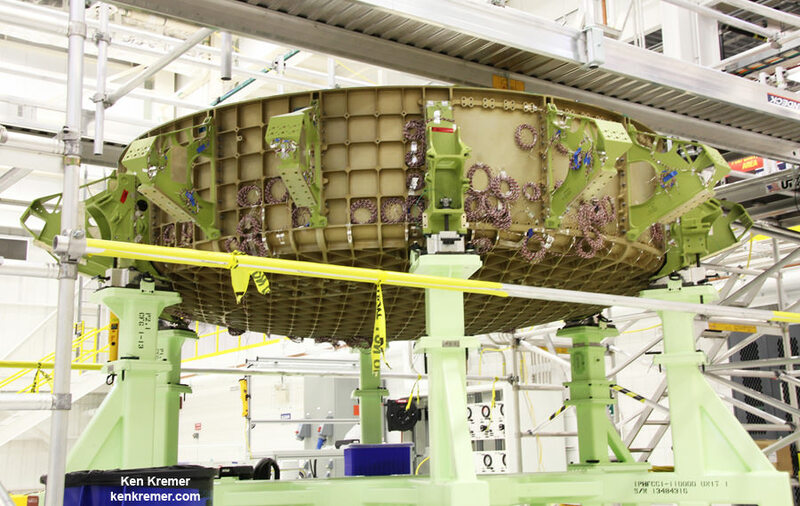 Indeed engineers just bolted together the upper and lower domes of Boeings maiden Starliner crew module last week, on May 2, forming the complete hull of the pressure vessel for the Structural Test Article (STA). Altogether there are 216 holes for the bolts. They have to line up perfectly. The seals are checked to make sure there are no leaks, which could be deadly in space. Starliner is being manufactured in Boeing’s Commercial Crew and Cargo Processing Facility (C3PF) at NASA’s Kennedy Space Center (KSC) in Florida. The STA will be subjected to rigorous environmental and loads testing to prove its fitness to fly humans to space and survive the harsh extremes of the space environment. 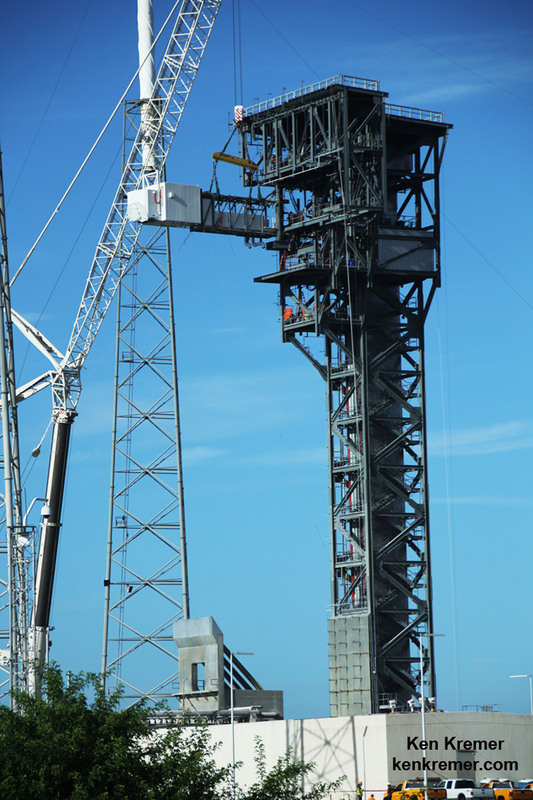 Regan cited three technical factors accounting for the delayed launch schedule. The first relates to mass. “First is mass of the spacecraft. Mass whether it’s from aircraft or spacecraft is obviously always something that’s inside the box. We are working that,” Regan stated. The second relates to aerodynamic loads which Boeing engineers believe they may have solved. The third relates to new software requirements from NASA for docking at the ISS. Due to huge CCP funding cuts by Congress, the targeted launch dates for both Starliner and Crew Dragon have been delayed repeatedly from the initially planned 2015 timeframe to the latest goal of 2017. The Structural Test Article plays a critical role serving as the pathfinder vehicle to validate the manufacturing and processing methods for the production of all the operational spacecraft that will follow in the future. Although it will never fly in space, the STA is currently being built inside the renovated C3PF using the same techniques and processes planned for the operational spacecraft that will carry astronaut crews of four or more aloft to the ISS in 2018 and beyond. “The Structural Test Article is not meant to ever fly in space but rather to prove the manufacturing methods and overall ability of the spacecraft to handle the demands of spaceflight carrying astronauts to the International Space Station,” says NASA. The STA is also the first spacecraft to come together inside the former shuttle hangar known as an orbiter processing facility, since shuttle Discovery was moved out of the facility following its retirement and move to the Smithsonian’s Udvar-Hazy Center near Washington, D.C., in 2012. “It’s actually bustling in there right now, which is awesome. Really exciting stuff,”Regan told me. Regan also confirmed that the completed Starliner STA will soon be transported to Boeing’s facility in Huntington Beach, California for a period of critical stress testing that verifies the capabilities and worthiness of the spacecraft. “Boeing’s testing facility in Huntington Beach, California has all the facilities to do the structural testing and apply loads. They are set up to test spacecraft,” said Danom Buck, manager of Boeing’s Manufacturing and Engineering team at KSC, during a prior interview in the C3PF. 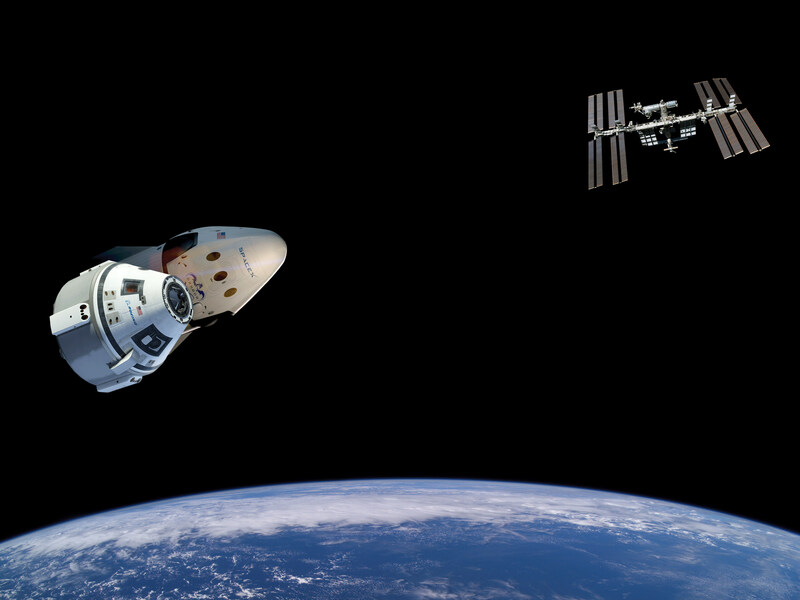 SpaceX has announced plans to launch their first crew Dragon test flight before the end of 2017. But the launch schedules for both Boeing and SpaceX are subject to review, dependent on satisfactorily achieving all agreed to milestones under the CCP contracts and approval by NASA, and can change at any time. So additional schedule alternations are not unexpected.